When Kish and I lived in Washington, D.C. in the early ’80s, a “Ban the Bomb” protestor camped in Lafayette Square Park, just across Pennsylvania Avenue from the White House. His protest area featured a number of hand-lettered signs about the perils of nuclear weapons that featured photos of the devastation at Hiroshima and Nagasaki. In those days of the Reagan Administration, nuclear weapons were a big issue: some American communities were declaring themselves “nuclear-free zones,” as if municipal ordinances could repel nuclear warheads, and President Reagan was accused of being a dangerous war-mongerer. Then the Berlin Wall fell, and the Soviet Union ceased to exist, and the United States and the Soviet Union talked about eliminating their nuclear stockpiles, and the worries about Mutually Assured Destruction and “duck and cover” seemed to be quaint issues that were behind us. 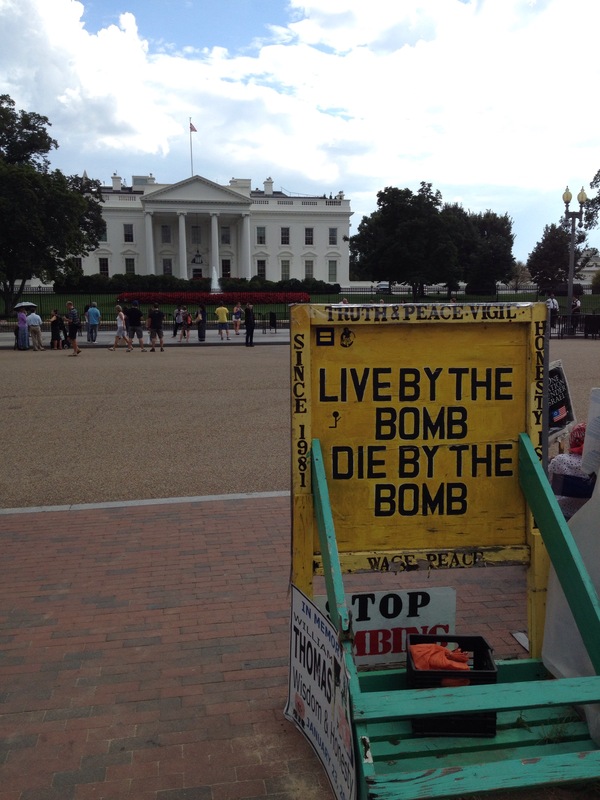 But, 35 years later, the “Ban the Bomb” protest is still there in Lafayette Park, with its little encampment and crude signage. And the nuclear issue, unfortunately, is still with us, too — except now the concerns aren’t about the Soviets, but about Iran, and North Korea, and ISIS, and rogue terrorist groups using nuclear weapons to advance their inexplicable political and religious agendas. Nuclear weapons are back on the front page, and the issue seems to have curdled and gotten worse, and more dangerous than ever. Nobody seemed to be paying much attention to the protest area, though. Maybe we should. Godzilla is returning to the big screen next year. The teaser trailer for the movie is out, and it looks like the film will have many of the elements that have made the Godzilla franchise a classic: a city laid waste, terrified running crowds, commuter rail cars ripped to smithereens — and Godzilla’s trademark shriek. Of course, among the things that will be lacking are the stunt guy in the rubbery suit who portrayed Godzilla, the clearly fake buildings being stepped on and destroyed by the King of Monsters, and the cheesy special effects as Godzilla encountered and fought giant moths and other oversized and bizarre creatures. One of the delights of the original Godzilla was the spliced-in footage of Raymond Burr playing a reporter covering the carnage caused by Godzilla’s emergence, which was added as an obvious afterthought in a studio effort to make the movie more palatable to American audiences. All of that will be gone now, replaced by state of the art computer-generated images and devastation. The Godzilla films have been interesting for a lot of reasons. Godzilla helped to reintroduce Japan to America after World War II and led the way for the much more significant cultural and business interaction that was to come in later years. 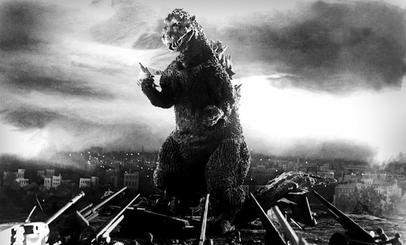 Godzilla also tapped a core fear of atomic power in the post-nuclear age, and was the first true environmental disaster film. And the enduring power of Godzilla himself became clear when, in later movies, Godzilla morphed from a mindless engine of destruction into a sensitive and sympathetic defender of Japan who was as much a victim of technology run amok as the poor wretches on the subway trains who were crushed in virtually every Godzilla movie. And then one day Godzilla met Bambi in one of the greatest student films ever made. The dead leader apparently will be succeeded by his son, Kim Jong-Un. Not much is known about him; he is in his 20s and was appointed the successor only last year. Whether he will continue the isolationist, mercurial policies followed by his father is anybody’s guess. He will inherit a country that is cut off from the rest of the world and a population that has been decimated by famine and ill-advised economic policies. There are lots of backward nations in the world, and we don’t usually care much about who leads them. North Korea is different because its focus always has been on its military — often at the expense of its starving people — and on constant saber-rattling with South Korea and its other democratic Asian neighbors. The fact that North Korea is largely unknown, has always been unpredictable, and has been publicly trying to develop nuclear weapons means we can’t overlook it in the face of the other challenges. The world is a very dangerous place. We’ll learn soon enough whether it has become more, or less, dangerous with Kim Jong-Il’s passing. As we drove around Lake Champlain yesterday, Kish and I passed through Plattsburgh, New York, and saw this gleaming behemoth, glinting in the noonday sun. 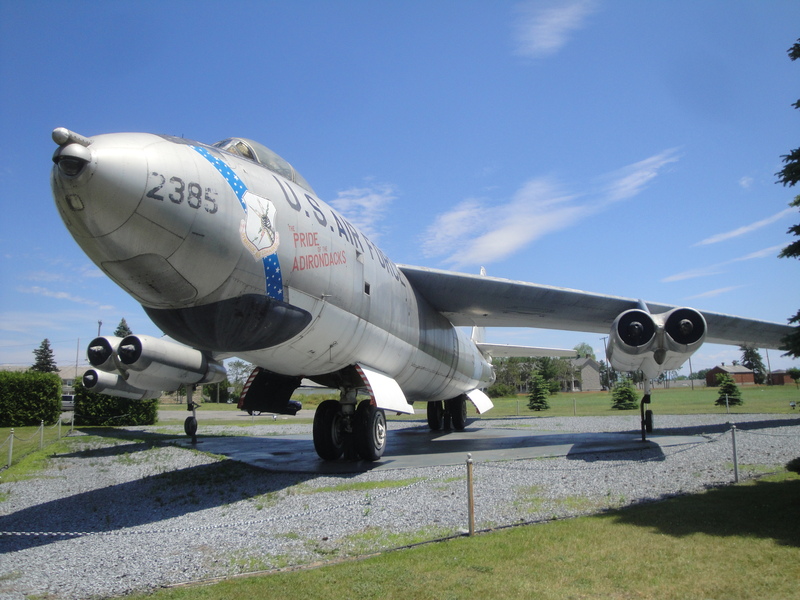 The enormous plane, labeled “The Pride of the Adirondacks,” is a Boeing B-47 Stratojet — the mainstay aircraft of the U.S. Strategic Air Command during the Cold War. In those pre-intercontinental ballistic missile days, these planes and their pilots and crew members were the tip of America’s nuclear spear. Looking at the specifications of the aircraft, it is not hard to see why. The B-47, which pioneered a “swept wing” jet engine design, used six huge turbojets and had a wingspan of 116 feet. Although the plane was more than 100 feet long, it was designed for only a three-man crew, because the vast majority of the plane’s storage space was intended for fuel and explosive ordinance. The B-47 could carry 25,000 tons of bombs and had a fuel capacity that gave it a maximum range of nearly 5,000 miles. In short, it could make the long-distance flights and then deliver the bomb payloads that were needed to make the strategy of nuclear deterrence and mutually assured destruction a viable reality. 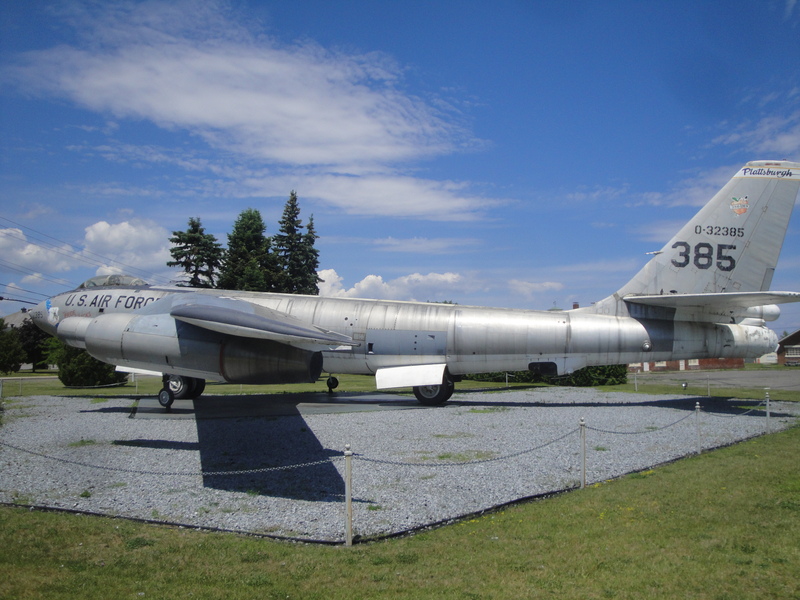 This B-47 is now parked next to a traffic roundabout by the deserted, moderately overgrown remains of brick outbuildings of the old Plattsburgh Air Force Base, which closed more than 15 years ago. The somewhat shabby surroundings stand in sharp contrast to the majesty of this enormous plane, whose glittering fuselage is showing signs of rust and wear and tear. It seems like an unseemly end for a plane that served the United States for so long, and so well. The recent disclosure about a new secret Iranian facility devoted to the Iranian nuclear program — one of several such facilities in Iran — significantly raises the stakes in our relations with that Islamic state. It seems clear that the President will focus, for the present, on getting international agreement to some form of new sanctions on Iran. The question is whether the Administration should do more, and when? Some believe that the United States’ slow response to the Iranian nuclear program, and its dithering with respect to the North Korean program, are just encouraging other rogue states to try to enter the nuclear fraternity. I doubt that Japan and other neighbors of North Korea are happy with the North Korean nuclear program or the missile tests the North Koreans have held in the past year. Such behavior is necessarily destabilizing. With each North Korean missile test I imagine the Japanese wonder whether, this time, the rogue government of Kim Jong Il has strapped a nuclear warhead aboard in hopes that the world will show it a bit more respect. In Iran, the risks are even higher due to the volatility of the Middle East generally, the oil reserves located there, and the disturbing nature of the Iranian regime. Shouldn’t we all be terrified by the prospect of a nuclear Iran, governed by medieval religious figures and led by a Holocaust-denying fanatic who threatens the existence of Israel with every speech? Aren’t the parallels to Hitler and Nazi Germany too obvious to be overlooked? Shouldn’t we take Mr. Ahmadinejad at his word in his vows to wipe Israel off the map, and realize that preemptive action may the only way to avoid a second Holocaust? The crucial difference between Iran and Nazi Germany, of course, is that Hitler, due to the technological limitations of his time, could only proceed through conventional warfare to cause a war that killed millions. If the Iranians succeed in developing nuclear weapons, they need only lob a few missiles at Israel, Saudi Arabia, and other nations to cause a global conflagration. The risks of that occurring are too appalling to contemplate or to permit. Any new sanctions regime should be brief and unyielding in its insistence that Iran stop its nuclear program; in the meantime the United States should be working with Israel and our allies to devise and, if necessary, carry out espionage and military options that will prevent Iran from realizing its evident nuclear ambitions.